Allow users to log in and sign up with their Facebook account, an option available under our Social Login integrations. Enabled SSL on your help desk. 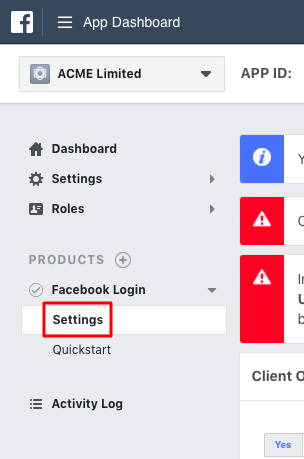 The Facebook provider is disabled by default and needs to be activated before use. To do this, go to Settings -> Users -> Social Login and click the "Activate" link on the Facebook provider box. A provider can be defined for each brand, the "Enabled" option should be toggled to on for it to be available to users on the frontend. 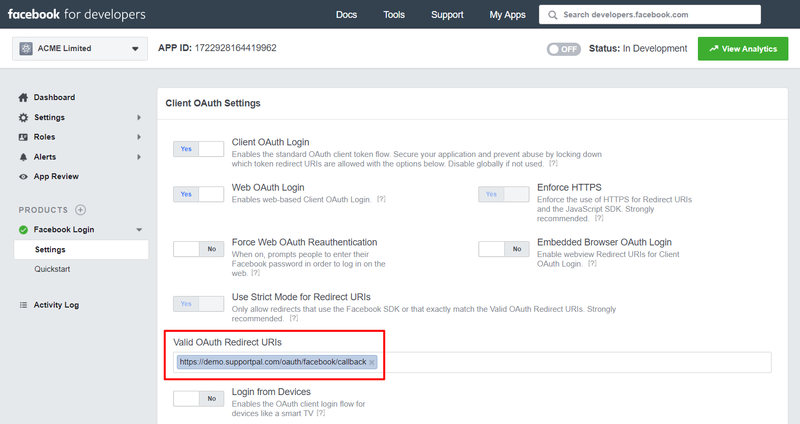 To set up Facebook login, you will need to set up a Facebook application, follow the steps below. Visit the applications page on the Facebook developers website - https://developers.facebook.com/apps - and click the "Add a New App" button. If you already have an application set up for the Facebook Channel, you can utilise it for this and skip ahead to step 4. The screen will load with your new app. 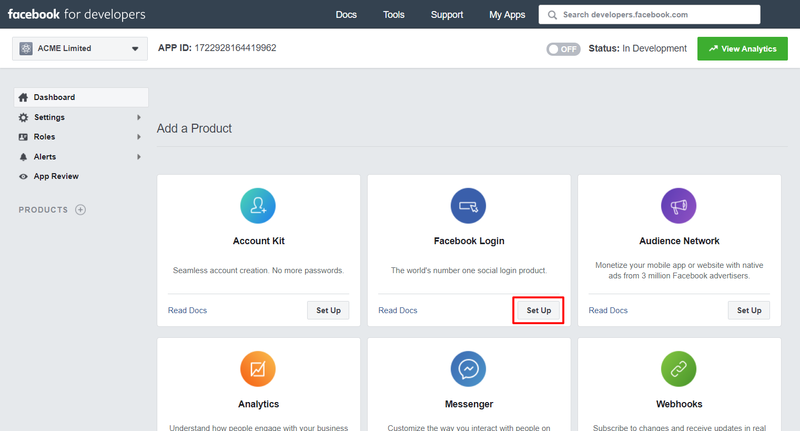 Click the "Set Up" button on the Facebook Login product. Select the "Web" option from the list of platforms shown. Enter your help desk URL for the site URL, and click "Save". The other sections in the quickstart and not necessary and can be skipped. Under the "Valid OAuth Redirect URIs" section, it must be set to the value shown in the SupportPal interface. 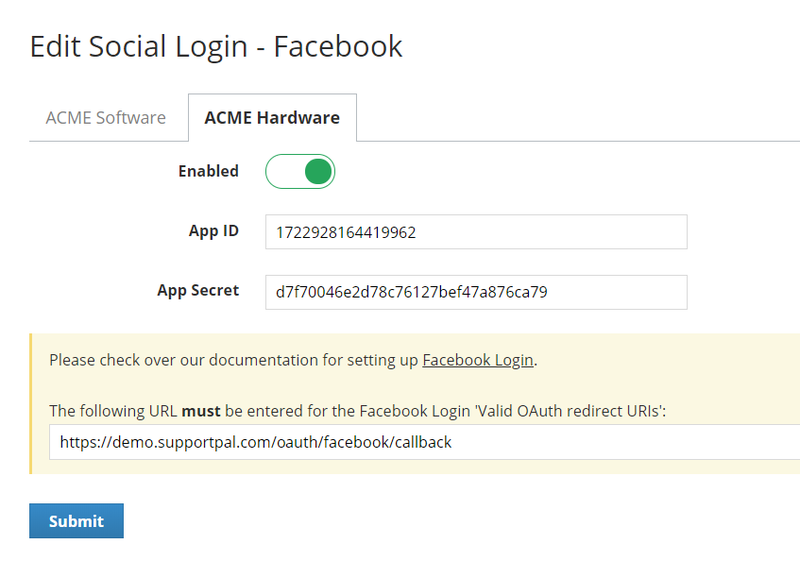 In our example, this is "https://demo.supportpal.com/oauth/facebook/callback". We now need the App Secret to complete the set up. Click "Settings" in the sidebar and then "Basic". Click "Show" in the App Secret box, copy this over to the SupportPal configuration screen along with the App ID, and click "Submit" to save. Please ensure the application shows as status "Live", or users won't be able to login using it. Please ensure you've entered the correct URL in the Valid OAuth Redirect URIs and App Domains as mentioned in steps 8 and 9. If your help desk has many brands or operates over a variety of domains/subdomains, all of these will need to be entered in the relevant sections. 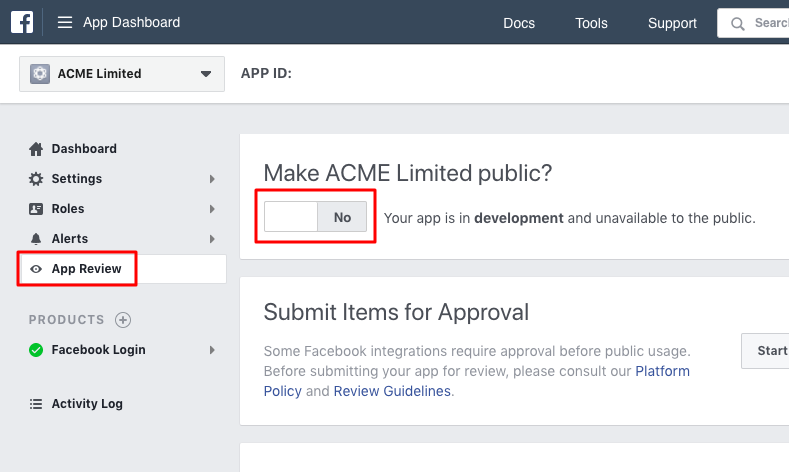 New Facebook applications created after March 2018 must redirect to a secure page, and this will become the case for all applications from March 2019. Please ensure you have enabled SSL in your help desk and set the HTTPS version of your URL in the Facebook settings. Please ensure the application is published and showing as live. 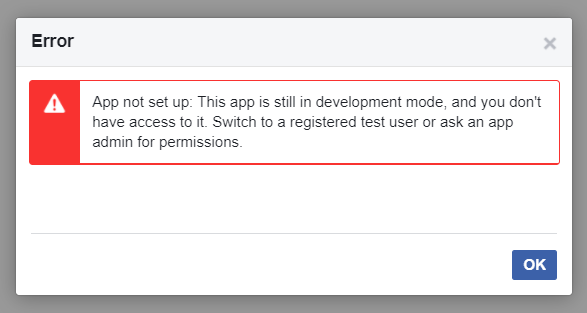 If it is still in development mode, other Facebook users will not be able to log in with it.